If you spend any time on social media, you’ve probably been hearing a lot about Paleo lately. After seeing so many amazing-yet-healthy recipes on Pinterest, I decided to try a few myself. This Key Lime Tart tastes like it’s bad for you, but it’s completely Paleo. I received this cookbook to review from Blogging for Books. This post contains affiliate links. By making a purchase through these links, you will be supporting A Savory Feast. What is Paleo? 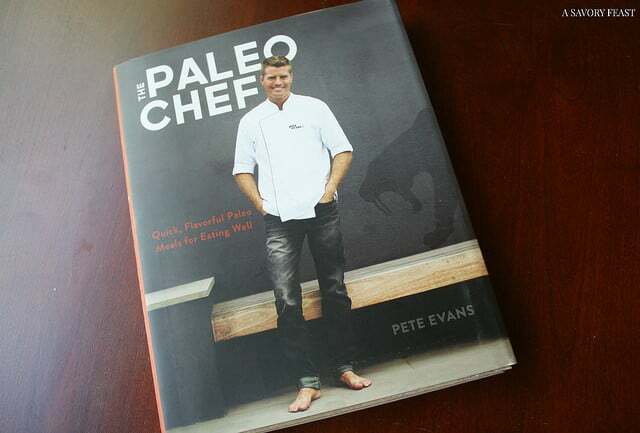 Pete Evans, the author of The Paleo Chef describes it as “a way of life, not a gimmick or diet.” The Paleo guidelines have you omit refined sugars, legumes, grains and most dairy from your diet. It’s searching out quality ingredients and staying away from processed food. If you been around here for awhile, you know that I’ve been working to develop a healthier lifestyle, especially when it comes to the foods I eat. While I don’t think I could ever go full-Paleo, the ideas and guidelines are something I’d like to try to incorporate into my lifestyle as often as possible. This book explains that the key to the Paleo lifestyle is to enjoy it! It shouldn’t be a strict diet. When you look at the recipes in this book, you won’t be able to believe some of them are good for you! While it may be more expensive and take longer, you can find ways to substitute healthy ingredients like nuts and honey instead of grains and sugar. But not all the recipes in this book are time consuming. Many of the recipes are designed with our busy lives in mind. 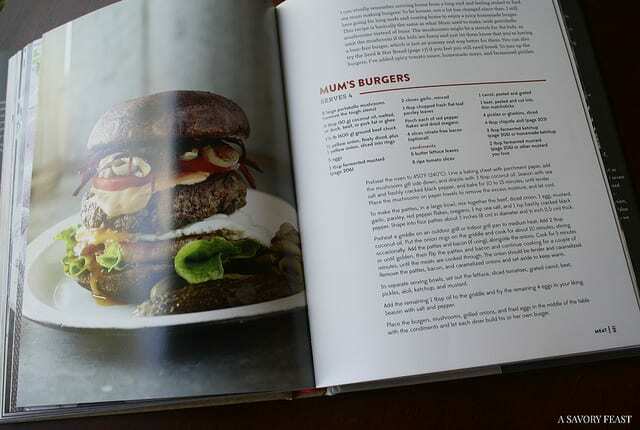 I’d like to try to eat a completely Paleo meal every so often, so I’m excited to try the recipes in this book! There are lots of delicious ideas for breakfast, snacks, dinner and desserts. Spring might be arriving everywhere else, but here in Florida it’s pretty much Summer already. It’s been in the 80’s and 90’s most days for the past month or so. Now that the time has changed, Andrew and I have been taking advantage of the longer hours of light and have been cooking out with our friends at least once a week. This past weekend we hosted a cookout and I wanted to make a dessert. I had just gotten this cookbook, so I decided to give one of the healthy sweets a try. 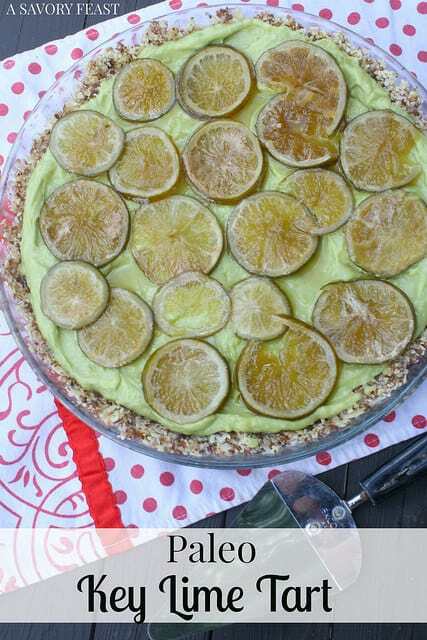 This Key Lime Tart was one of the first recipes I saw, and I was sold! When it comes to dessert, nothing says “Summer” like key lime. It’s the perfect thing for a warm weather cookout. I could eat the filling for this tart by itself! Even though the main ingredient is avocados, the lime juice is very dominating. Your guests won’t believe this treat is actually healthy! Bring a saucepan of water to a boil, add the limes, and blanch for a few seconds. Drain and plunge in a bowl of ice water. Repeat this process twice more. Combine 1 cup water and the honey in a small saucepan over high heat. Bring to a boil, stirring to combine. Add the blanched limes, reduce the heat, and gently simmer until the limes become translucent, 40 to 60 minutes. Allow to cool completely in the syrup. You won't need the syrup for the recipe, you can can keep it in an airtight container in the refrigerator for up to 3 months. 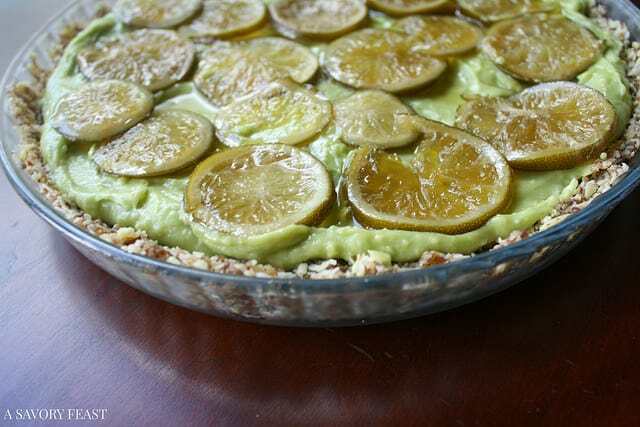 While the limes are simmering, make the crust. Combine the almonds and coconut in a food processor and process until broken up into a nice crumble. Add the dates, vanilla bean seeds, coconut oil and a pinch of sea salt, and pulse until the mixture just comes together. Press the dough firmly and evenly into a 4 1/2 by 13 3/4-inch rectangular tart pan with removable bottom or a 12 inch round tart pan. Refrigerate for at least 1 hour, or until firm. Combine the avocados, lime juice, honey, coconut oil and 1/2 tsp of salt in a blender. Blend until smooth. Adjust the flavors to taste. Pour the filling into the crust, spread it into a smooth, even layer, and chill for at least 4 hours, or overnight. Garnish with the candied lime slices and serve. Notes: If you don't have time to soak the almonds, you can skip that step. I did, and it still turned out fine. Also, if you can't find unsweetened coconut, you can use sweetened. It is still very low in sugar so this will still be a healthy dessert, but not completely paleo. Have you tried the Paleo lifestyle? What did you like/dislike about it? I’ve been interested in Paleo for a long long time. I’m going to try this recipe and see if I can get that book on my kindle. 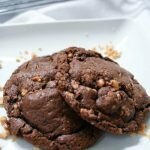 I have been wanting to try some Paleo recipes! After reading more about it, I don’t think I’d want to completely go Paleo, but it would be healthy to incorporate some recipes more often. Yum! 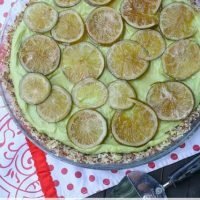 There’s a similar key lime pie recipe in the Thrive cookbook that I’ve been meaning to try for ages. This reminded me 🙂 SO jealous of your summer weather! I’m still in my winter coat, hats and gloves here. I love anything key lime! You should make this and pretend it’s Summer. It was SO good! It tastes really sweet like it’s bad for you, but it’s so healthy. You should give it a try! I love anything key lime. Yummy yummy yummy. Ya know I’ve never eaten a line. I think it’s about time I start! What?!? You should try it for sure! Key lime desserts are so yummy. Wow I love the sound of that filling! 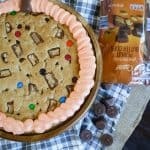 I actually prefer my avocados as desserts these days so this is one I can definitely add in to my sweet treat rotation! I’ve actually been eating an 80% paleo diet for a couple of years now and it suits me perfectly – my health and happiness have both massively increased in that time! 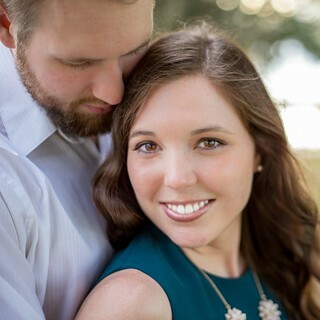 Thank you so much for sharing your experience with Paleo! You are one of the first people I’ve heard from who did a mostly-Paleo diet. I want to try about 80% as well. 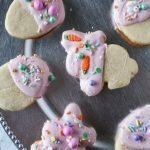 I couldn’t give up grains and sugar entirely! Key Lime desserts are some of my favorites! Usually I go for chocolate, but if not key lime is my next choice. This tart was delicious, and it’s guilt-free! Thanks for the heads up! I have updated the recipe. I have sorta done Paleo in the past, but it isn’t something that I’m super strict about. I need more carbs and the beans that aren’t allowed on Paleo help stretch our grocery budget. 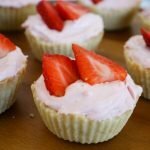 This tart looks delicious and I really want to try it soon! I just need to get a few ingredients. Paleo can be pretty expensive! I was just looking through the book and trying to pick some recipes for the week and the problem is I don’t have a lot of the ingredients in the house. The carbs aren’t a huge deal for me to cut out, but I would miss rice too much if I went full Paleo!